Whether you are a redneck, fan of a redneck or have a sense of humor, follow these directions to make yourself your very own redneck chimes that are sure to make everyone laugh. The ultimate in recycled crafts, you can create it from items you have laying around the house. Cut or find a piece of wood that is approximately 2 1/2" X 7". The wood does not have to be perfectly square nor that exact size. Using a ice pick or small drill put in 6 small holes spaced apart and two holes on the top of the wood. 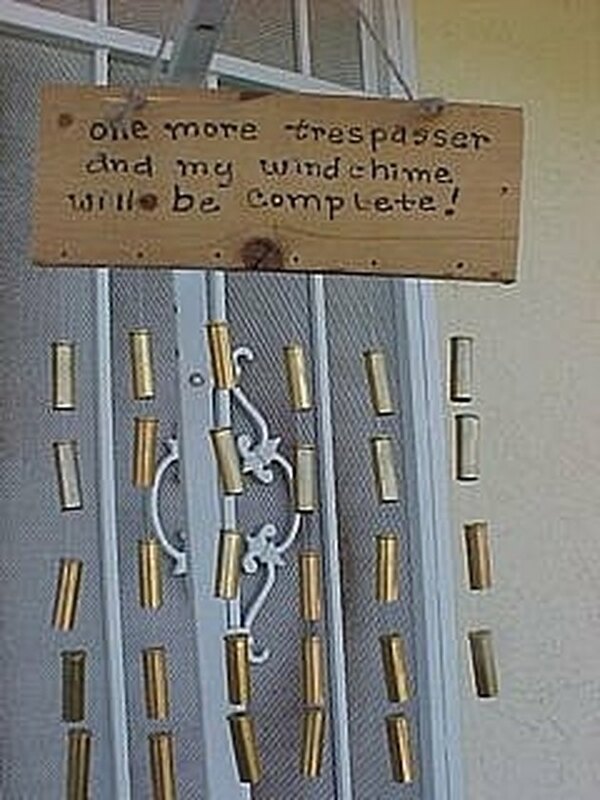 Write the words "One more trespasser and my wind chime will be complete!" in black felt pen. Free hand the words, you do not have to worry about it being perfect but it should be legible. Feed the fishing line through the shell and leave about an inch from the top, so that you can attach it to the wood. Tie a knot to keep the bullet from moving. Repeat this process until you have 5 shells on 5 strings and 4 shells on the 6th string. Tie one line of shells onto the first hole on the wood and the next to the 2nd hole, etc. till you put the last string with the 4 shells on the wood. Either use more fishing line or a piece of wire to make the hanger for the wind chime and you are done.